Patrik Berglund has scored only one goal this season for the Blues. 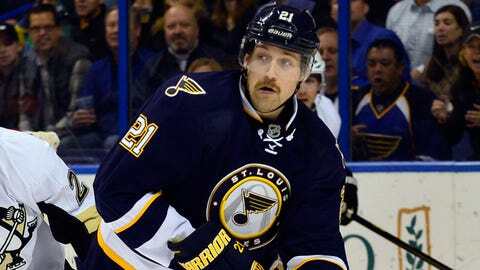 ST. LOUIS — Patrik Berglund doesn’t need a reminder he has only one goal in 26 games this season. He’s well aware of the fact. Berglund is one of those guys who can still impact a game even without scoring. He’s one of only four forwards on the Blues’ roster who plays at least 1:27 on the penalty kill and 1:30 on the power play. Coach Ken Hitchcock believes there are areas of his game at which he is excelling. Hitchcock would like to see Berglund be a little more selfish in the offensive zone and not look to defer as often as he has this season. There have been opportunities for him to pull the trigger, only to see him pass the puck instead. Berglund says his confidence hasn’t wavered but does admit to doubting a little bit when presented with a scoring chance. Berglund, who agreed to a one-year contract with the Blues last summer, understands the one thing he can control is his effort. The former first-round draft pick from Vasteras, Sweden, can’t allow his emotions to get the best of him just 26 games into the season. He was bothered by an upper-body injury a few weeks ago but seems to be fully recovered. Playing on the inside should allow for the puck to eventually find his stick. He’s a big body who protects the puck and can be difficult to contain in space. The Blues will eventually need him to rediscover his scoring touch, but he’s not walking with his head down. — Who would have thought the Blues would miss Ryan Reaves as much as they do? This isn’t about fighting, but his ability to create energy. He plays with an edge and has more presence off the ice than given credit for. I’m not sure the outcome would have been different against San Jose and LA with Reaves in the lineup, but there’s no doubting his value to this club. He gets guys going emotionally in the dressing room and gets the attention of the opposition. Opposing defensemen know when he’s on the ice. — The Blues were all business during Wednesday’s practice. Barret Jackman really impressed me with how hard he went at it in practice, particularly in one-on-one battle drills. He gets his teammates’ attention with the way he competes, and there’s something to be said for that. He went all-out in a battle drill against Maxim Lapierre that probably caught Lapierre by surprise. This is the way you have to practice if you want to be a winning team. This is a genuine response from Jackman, who did the same thing when he was 20. — Ian Cole credits assistant coach Brad Shaw for helping him on and off the ice throughout his career. It’s not easy going several weeks at a time without playing a game, and Shaw has been a huge influence, according to Cole. Shaw has helped Cole both learn and understand the adjustments needed to become an every-game NHL player. The relationships assistant coaches have with their players is sometimes the most important quality they can bring to a team. If you can’t be honest and communicate with people, it’s a hard business to survive. Shaw has been a consistent presence on the Blues’ bench for several years now. — The Blues have scored just two more first-period goals (28) than they’ve allowed (26) this season. This includes six in the past two games. The Blues are the best in the NHL in second- and third-period goals against, allowing only 16 and 15, respectively. You can follow Andy Strickland on Twitter at @andystrickland or email him at strickland.andy@gmail.com. He also writes about the Blues and the NHL at truehockey.com.